In April 2005, the capital city of Harare embarked on Operation Restore Order, ostensibly an urban rationalization program, which resulted in the destruction of the homes or businesses of 700,000 mostly poor supporters of the opposition. MUGABE in June 2007 instituted price controls on all basic commodities causing panic buying and leaving store shelves empty for months. General elections held in March 2008 contained irregularities but still amounted to a censure of the ZANU-PF-led government with the opposition winning a majority of seats in parliament. Movement for Democratic Change - Tsvangirai opposition leader Morgan TSVANGIRAI won the most votes in the presidential poll, but not enough to win outright. In the lead up to a run-off election in late June 2008, considerable violence against opposition party members led to the withdrawal of TSVANGIRAI from the ballot. Extensive evidence of violence and intimidation resulted in international condemnation of the process. Difficult negotiations over a power-sharing "government of national unity," in which MUGABE remained president and TSVANGIRAI became prime minister, were finally settled in February 2009, although the leaders failed to agree upon many key outstanding governmental issues. MUGABE was reelected president in June 2013 in balloting that was severely flawed and internationally condemned. 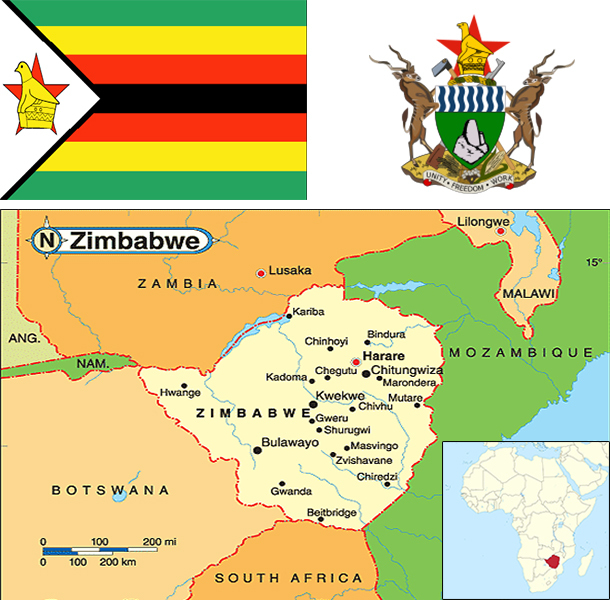 As a prerequisite to holding the election, Zimbabwe enacted a new constitution by referendum, although many provisions in the new constitution have yet to be codified in law. Zimbabwe's economy depends heavily on its mining and agriculture sectors. Following a decade of contraction from 1998 to 2008, the economy recorded real growth of more than 10% per year from 2010-13, before slowing to roughly 3% in 2014 due to poor harvests, low diamond revenues, and decreased investment. Infrastructure and regulatory deficiencies, a poor investment climate, a large public and external debt burden, and extremely high government wage expenses impede the country’s economic performance. Until early 2009, the Reserve Bank of Zimbabwe (RBZ) routinely printed money to fund the budget deficit, causing hyperinflation. Dollarization in early 2009 - which allowed currencies such as the Botswana pula, the South Africa rand, and the US dollar to be used locally - ended hyperinflation and reduced inflation below 10% per year, but exposed structural weaknesses that inhibit broad-based growth. The RBZ introduced bond coins denominated in 1, 5, 10, and 25 cent increments on a par with the US dollar in December 2014, more than five years after the Zimbabwe dollar was taken out of circulation. In January 2015, as part of the government’s effort to boost trade and attract foreign investment, the RBZ announced that the Chinese renmimbi, Indian rupee, Australian dollar, and Japanese yen would be accepted as legal tender in Zimbabwe. Zimbabwe’s government entered a second Staff Monitored Program with the International Monetary Fund in 2014 and undertook other measures to reengage with international financial institutions. Foreign and domestic investment continues to be hindered by the lack of clarity regarding the government’s Indigenization and Economic Empowerment Act.